The A Building, also know as Sea Breeze, features fully-equipped one and two bedroom condos with direct and moderate ocean views, also low ocean and and park views. The lazy river water park features a 375 foot lazy river, a wet deck featuring a bucket dump, swimming pool, kiddie pool with mushroom fountain and large 12 person hot tub, as well as a seasonal snack bar and is situated directly behind the A Building. 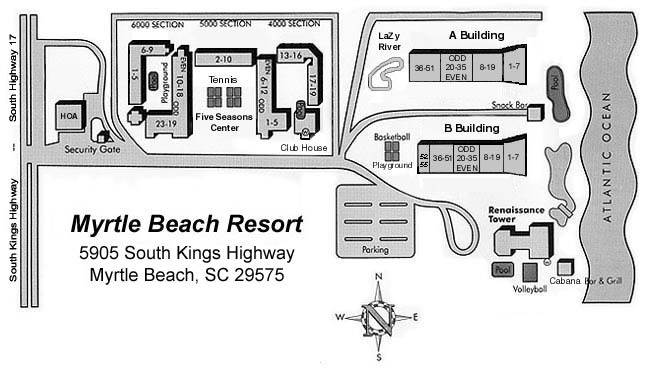 The Grand Strand's largest oceanfront pool and snack bar is situated right between this resort building and the blue waters of the Atlantic Ocean. The A Building offers a wide array of amenities located throughout the resort, with easy access to pools, cabana bar and grill, playground, basketball court, shuffleboard, bocce ball court, picnic and grilling areas. There is always a lot of fun and sun for everyone. 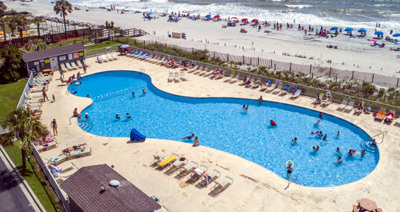 The Strand's largest oceanfront pool and snack bar is situated in front of the A Building, just steps from the blue waters of the Atlantic Ocean. There are four outdoor pools, two indoor pools and three health spas with steam rooms, saunas and jacuzzis. 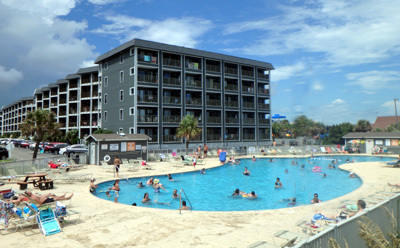 The resort also features a water park with a wet deck and one of the largest lazy rivers on the Grand Strand. The B Building, also know as Ocean Spa, features fully equipped one and two bedroom condos with balconies and fabulous direct oceanfront views, moderate ocean views, low ocean views, and park views for your enjoyment. All this a just a few steps from the deep blue Atlantic Ocean on the Grand Strand. 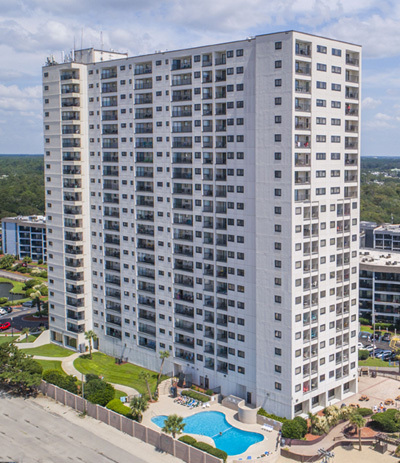 The Renaissance Tower is a 22-story high-rise Myrtle Beach oceanfront resort that features fabulous views of the coastline from the balcony of every condo. Fully equipped condos range from ocean view to oceanfront efficiencies, studios, and one and two bedroom units. Amenities located inside the Tower include a sauna, steam rooms, heated whirlpool, exercise room , guest showers, game room, laundry, deli, outdoor pool picnic & grilling area, volleyball and an exciting oceanfront cabana bar & grill featuring regularly scheduled seasonal entertainment. The Renaissance Tower has earned bragging rights for the best views on the beach. 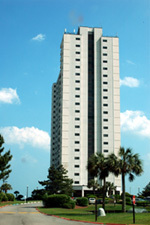 The Five Seasons Center area, unlike our other resort buildings, is made up of an assortment of condo buildings, all of which are located in a natural setting. These are one and two bedroom condominiums that are just a short walk to the beach. All condos come fully furnished with beautiful décor and furnishings, high speed Internet, and kitchens having everything you need for complete meal preparation. We have condos offering park and courtyard views. Please know there are no elevators at the Five Seasons complex. 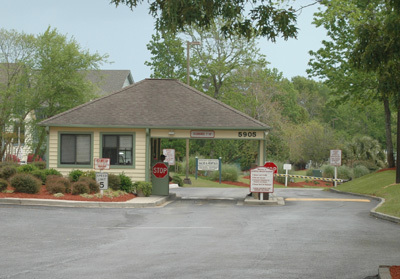 Visitors are able to enjoy beautiful park views and make use of the tennis courts, pools, a southern garden and gazebo, and the Five Seasons Center. The Five Season's Center features an indoor/outdoor pool, indoor jacuzzi, steam room, sauna, putting green, playground area, picnic and grilling areas, laundry facilities, and lots more. The Five Season Center is a fun gathering place. Stop by the indoor/outdoor pool to swim or just sit and relax or have a snack in the vending area. 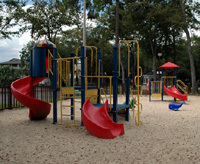 In addition to all of the other fun things to do at the resort, there is a play area just for children and a family picnic area. We want you and your family to have the best vacation ever so we stop at nothing to provide all the necessary elements for that to happen! 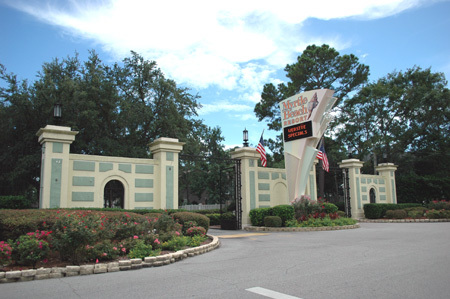 This is entrance to fun and sun and the best vacation ever so welcome to the Myrtle Beach Resort. 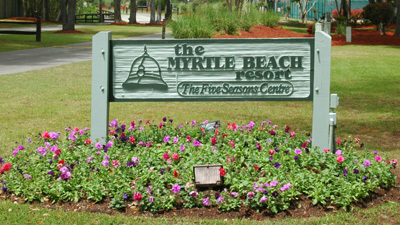 The Myrtle Beach Resort has controlled entry access and 24 hour per day roving security. Relax and enjoy the vacation of a lifetime. 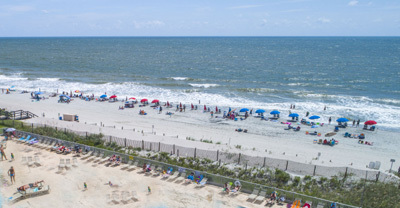 There is no better place to be than on the white sandy beach of the Myrtle Beach Resort on the famous Grand Strand of South Carolina. 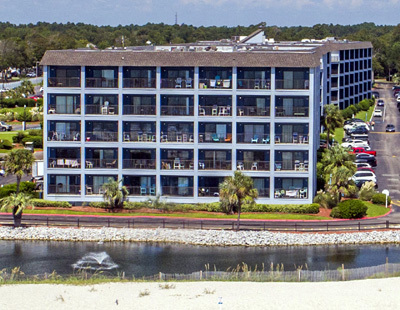 At Myrtle Beach Resort we offer an array of amenities that are conveniently accessible from all of our vacation condos. The waterpark with a 375 foot heated Lazy River, Wet deck, bucket dump, mushroom shower, kiddy pool and a large, 4-section hot tub. 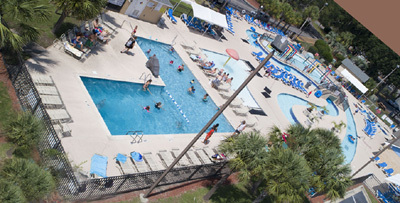 Also available to all resort guests are a childrens playground, basketball court, shuffleboard, bocce ball court, picnic and grilling areas,the largest oceanfront swimming pool in the area and poolside snack bar, deli/cafe, convenience store, game room, gift shop, and an enclosed indoor atrium available for all of our guests to use regardless of which Myrtle Beach Resort they are staying in. 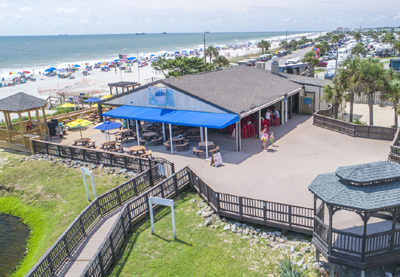 The Quarterdeck Beach Bar & Grill is open during the peak summer rental season. Enjoy live entertainment, cool drinks, great food and a fantastic view during the summer months. Resort guests enjoy the fun of the Quarterdeck Cabana Bar every day and night in an atmosphere of family fun, fellowship and to test out the vocal cords with Karaoke. You will find the staff and service the best on the beach. All this and you never have to leave the resort.